CONFESSION: I have never been a fan of cauliflower. Ever. I have always liked broccoli, but couldn’t get into cauliflower. In the last year or so, I have found a few recipes that have changed my mind. Cauliflower pizza crust is one of them and I have an awesome roasted cauliflower recipe. THIS IS ONE OF THOSE RECIPES. 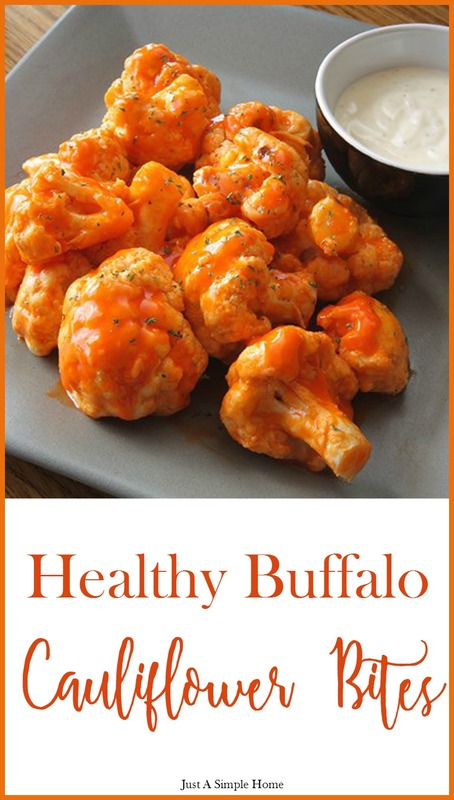 It has even been approved by my Buffalo wing loving husband, so you know it’s good! If you are trying to eat healthier but are still craving that crunch and burst of flavor, you’ll want to try these. Give them a chance and let me know what you think! 2. Combine yogurt and cheese in a small bowl; mix well. Refrigerate until needed. 3. Lightly coat large baking sheet with spray. 4. Place cauliflower florets on baking sheet. Coat cauliflower lightly with spray. Season evenly with ¼ tsp. salt. 5. Bake for 20 minutes, or until tender-crisp. 6. While cauliflower is baking, combine hot sauce, rice vinegar, and cornstarch in medium saucepan; whisk until cornstarch is dissolved. 7. Add chili powder, paprika, garlic powder, onion powder, maple syrup, oil, and remaining ¼ tsp. salt; whisk to blend. 8. Heat hot sauce mixture over medium-high heat; cook, stirring frequently, for 10 minutes, or until thickened. Set aside. 9. Pour hot sauce mixture over baked cauliflower (on baking sheet); mix well. 10. Return cauliflower to oven. Bake for 5 minutes. 11. Serve hot with sauce. Makes 6 Servings!!! On the fix?! One serving is one GREEN and 1 tsp. Hope you enjoy! Feel free to share this post with your friends! DO YOU HAVE HEALTH GOALS TO ACCOMPLISH FOR THE NEW YEAR? SPOTS ARE OPEN FOR OUR NEW YEAR, NEW YOU ACCOUNTABILITY GROUP!